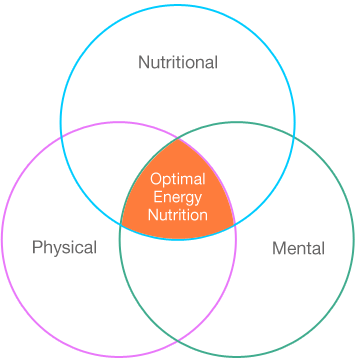 At Optimal Energy Nutrition we take your health very seriously and strive to give you the best personalised, results orientated care, where you feel you have been listened to and are involved in, a guided programme leading to your own energetic life. Disclaimer: Each person is an individual and may experience different results depending on their body environment. The causes of fatigue may be biochemical, but the pathways affected may be influenced by the way that we think. It has been shown that effective thinking skills can lower levels of distress, lower rates of depression and improve coping skills in times of stress or hardship, influencing our levels of fatigue. It is therefore our intention at Optimal Energy Nutrition to assess what applications and education may be of benefit to you from cognitive psychology and NLP to live your life optimally. Having worked as a physiotherapist observing elite sports performance, this brought about an understanding of the links between having a physically fit body and recovery times from illness and injury. Stress can cause irregularities in levels of a hormone called cortisol, produced from the adrenal glands . If cortisol is elevated from continued stress or stressful events, this can have a detrimental effect on the body such as disruption of sleep, problems with digestion and fatigue. Research has found that targeted exercises can help to reduce these negative effects, lowering cortisol and improving energy. If however you have chronic fatigue, increased exercise may exacerbate your condition, so it may be necessary to begin with breathing exercises, to support relaxation and decrease sympathetic over activity, whilst learning to pace your activities. Optimising energy requires all of the body’s systems to be balanced particularly blood sugar levels, appropriate responses to stress by the adrenal glands, and optimal thyroid levels, regulating the rate at which fats, proteins and carbohydrates are metabolised at a cellular level. Essential fats are important, in the right balance, to maintain the integrity of the cellular membranes facilitating the passage of nutrients into the cell and metabolites out. It is also important to recognise the presence of viruses, bacteria and other pathogens, along with increase levels of chemical toxicity, which may be an underlying factor contributing to overall fatigue.